"I wish you could see how much my kids love your blankets. My kids can't go ANYWHERE without those blankets. 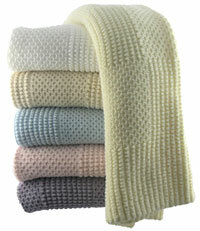 This blanket has a beautifully textured geometric pattern that babies just love to rub. Made out of 100% ring-spun combed cotton, so soft, yet so durable. Available in 7 colors. Measures approximately 32 X 42 inches.